Cost-effective, easy-to-use advertising layout and issue management software for small- to mid-size publications. Ever had to retype your ad manifest because you couldn’t extract the information from your order-entry system? Ever guessed wrong on how many pages should be in your issue? Ever placed that color ad on a page without color? AdForce ad layout solution helps you avoid common pitfalls like these, shortening production time and reducing costly make-goods. AdForce works with your order-entry system and keeps track of all your insertion information, while you decide how the issue will look. You can define multiple attributes for each issue, including page size and number of columns. Ads imported from your order-entry system go on a runsheet you can customize to highlight the ad properties most important to your operation. AdForce supports multiple ad types and accommodates a wide array of characteristics and layout attributes. Set up different import maps to create the new runsheet, revise existing ad specs and handle kill orders in a timely fashion. Ad information — name, number, size, color, coupon status, market, advertiser, requested page and so on — pours right into the runsheet. You can also import file-path information for digital ads. No more hunting for images — they show up right where they should for your pagination program. Once the issue is set and your runsheet is created, AdForce has multiple options for ad placement. Use the Layout palette to flow all the ads at once, letting AdForce pick its spots based on settings you’ve selected — for example, dropping them evenly throughout the book, or placing them only on left-hand pages. Or just drag and drop each ad as you see fit. AdForce manages the positioning of color pages and color ads, and can track process, spot and custom colors. 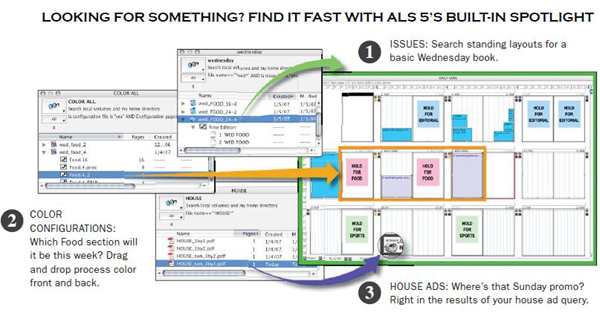 Tell it what you have, on what pages, and let AdForce figure out where the ads can go. Basic conflict rules in the application also honor specific page requests, control left- or right-hand page positioning and won’t place coupons back to back. Conflict preflighting flags conflicting ads as you make placements, giving you the opportunity to resolve or ignore the conflict on the spot. You can also easily check for conflicts by running a Conflict Report. Placement information in the runsheet is updated automatically regardless of what method you use. And with with the Views palette, you can tune up the layouts so it’s easy to see the ad information you need. When you’re ready, AdForce can print dummies and runsheets any way you want — sort on any available variable, or use the Views palette to tailor different sets of dummies for advertising and editorial. AdForce also supports PDF workflow, with the ability to jump-start the pagination process by importing and handing off links to Adobe® InDesign® and QuarkXPress®. Fully electronic ad production is a must in today’s publishing business. AdForce is the digital dummying solution for shops that aren’t ready to step up to ALS. If you think there’s no time like the present to reduce ad-placement headaches, improve your output and save money on make-goods, contact a sales representative at News-Net. 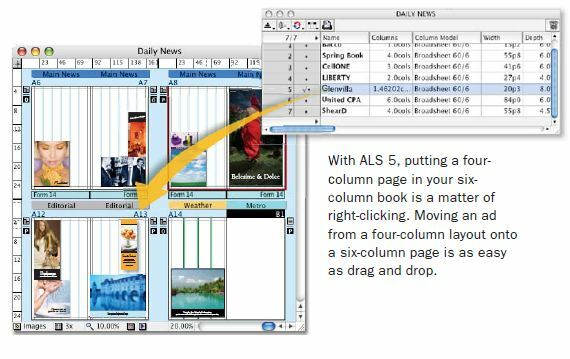 Used at more publications worldwide than any other automated ad layout solution, ALS lets you manage issue planning and ad layout for any publication. In just a matter of seconds, you can create a complete issue that can be opened in QuarkXPress or Adobe InDesign. With its accuracy, flexibility and robust feature set, ALS saves time, reduces errors and cuts costs. ALS is powerful yet easy to use. You have complete control and can automate as much or as little of the issue-building and ad placement as you need. ALS builds runsheets and dummies and places ads and creates ad stacks according to your rules. You can program where ads go based on editorial-to-advertising ratios and color configurations while still accommodating special considerations such as coupons, section or page orders and customer requests. It even produces reports. In short, it does everything you need and much more! AdForce or Page Director ALS?